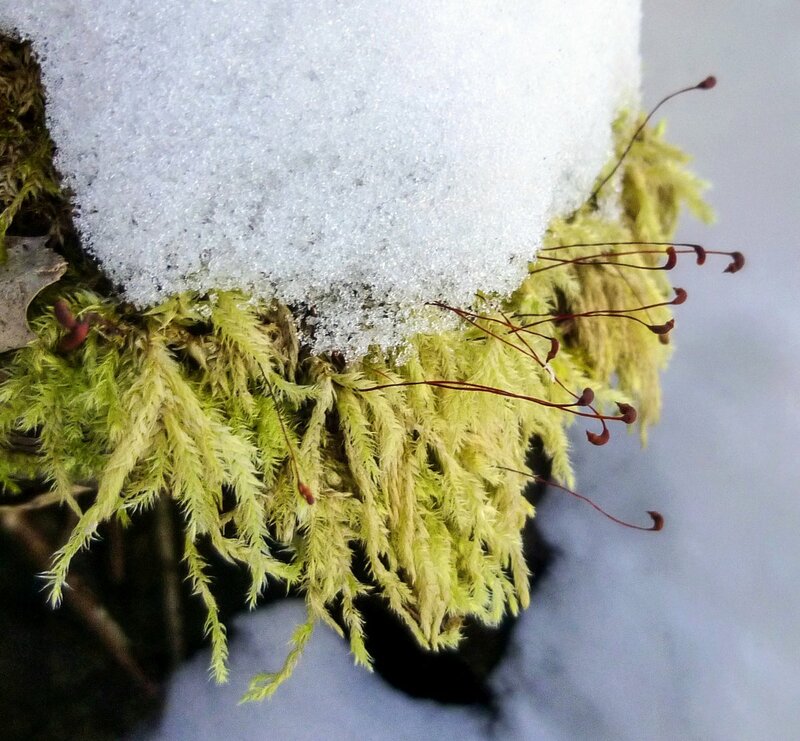 An Oedipus complex in mosses? Nannandrous … phyllodioicous … gotta love botanical terms and these will most definitely find their way into this week’s list of favorite words! Both refer to the tiny epiphytic nature of males situated on much larger female shoots. There may be many hundreds of the so-called dwarf males per female shoot. This type of sexual system may decrease intersexual competition while increasing the potential for outcrossing and polyandry. Indeed, polyandry enables male-male competition and post-fertilization selection as well as halting the spread of selfish genetic elements. Mosses are the only known sessile terrestrial organisms with epiphytic dwarf males. Spore dispersal in mosses is leptokurtic. So, males spores of closely related species and those produced by nearby or even the same female shoot may mature on a female. Females may, therefore, not be too choosy. Few studies have addressed patterns of inbreeding versus outcrossing in haploid-diploid organisms, it’s unclear the extent to which a dwarf male sexual system leads to on or the other as compared to species without dwarf males. Unlike diploid organisms, there are two types of selfing which can occur in haploid-diploid species, such as mosses, ferns or seaweeds. Intragametophytic selfing occurs in monoecious species and results in 100% homozygosity. This is the type of selfing that is mechanistically similar to selfing in diploid organisms where fertilization occurs with male and female gametes produced by the same individual. Intergametophytic selfing is the unique type to these organisms whereby cross-fertilization occurs between a female and male gametophyte, but the mother and father are produced by the same sporophyte. This is directly analogous to selfing in diploid organisms, despite the cross-fertilization of gametes produced by two different individuals. Intergametophytic selfing results in a 50% reduction of heterozygosity, comparable to selfing in vascular plants. Due to the lack of morphological features facilitating sperm competition in mosses, post-fertilization selection is likely more common whereby females preferentially support sporophytes (that grow on the female gametophyte) with higher heterozygosity (Szövényi et al. 2009). whether high levels of inbreeding is a consequence of the dwarf male sexual system, or whether it is counteracted by mechanisms such as polyandry and/or post-fertilization selection [in the moss Homalothecium lutescens]. They used SNPs, one of the first studies I’ve stumbled across utilizing this approach for the study of mating systems. The pretty cool thing about haploid-diploid species is the ease with which paternity analyses can be done … by genotyping the female and the sporophyte, it is possible to determine the paternal genotype. The sporophyte is attached to the female, so the female’s (or maternal) genotype can be subtracted from the sporophyte, et voila the paternal genotype … no need for maximum likelihood! Polyandry seems to be the rule were an average of 59% of the sporophytes had distinct fathers. In a moss without dwarf males, there was an average of 64% of sporophytes with different fathers (Szövényi et al. 2009). In two red seaweeds with similar restricted dispersal, averages were between 63% and 94% of the sporophytes (i.e., cystocarps) were sired by different dads (Engel et al. 1999, Krueger-Hadfield et al. 2015). Thus, polyandry can exert a strong influence on mating system evolution. The effective size of a population increased as more males are mating and may decrease the risk for genetic drift. suggest frequent mother–son mating events. [Though ] sporadic fertilizations by dwarf males originating from nonhost female shoots [may] counteract strong inbreeding. Moreover, the haploid stage may enable efficient purging of deleterious alleles, though studies investigating this are few. Despite some mother-son mating events, a sort of passive Oedipus-type tale, may not be so tragic after all. All in all a pretty cool study utilizing more polymorphic markers to address mating system evolution! Engel CR, Wattier R, Destombe C, Valero M (1999). Performance of non-motile male gametes in the sea: analysis of paternity and fertilization success in a natural population of a red seaweed, Gracilaria gracilis. Proc R Soc London B Biol 266: 1879–1886. Krueger-Hadfield, SA, Roze D, Correa JA, Destombe C, Valero M (2015). O father where art thou? Paternity analyses in a natural population of the haploid–diploid seaweed Chondrus crispus. Heredity 114: 185-194. Rosengren F, et al. 2016. Balance between inbreeding and outcrossing in a nannandrous species, the moss Homalothecium lutescens. Heredity 116: 107–113. Szövényi P, Ricca M, Shaw AJ (2009). Multiple paternity and sporophytic inbreeding depression in a dioicous moss species. Heredity 103: 394–403. Szövényi P, Devos N, Weston DJ, Yang X, Hock Z, Shaw JA et al. (2014). Efficient purging of deleterious mutations in plants with haploid selfing. Genome Biol Evol 6: 1238–1252. This entry was posted in bioinformatics, evolution, genomics, haploid-diploid, plants, population genetics and tagged haploid-diploid, mating system evolution, mosses, SNPs. Bookmark the permalink.